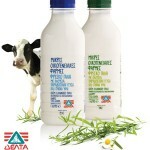 Vivartia > products & services > Delta Foods S.A.
DELTA FOOD S.A., member of the Vivartia Group of companies, produces and distributes dairy products such as, milk, yoghurt, cheeses and fresh fruit juices; DELTA FOOD S.A. is the leader in the overall market in which it operates. Some of its most well-known brands are: DELTA Fresh Milk, Small Family Farms, Milko, DELTA Advance, Life, Complet, DELTA Daily, Vlachas, Natural, Vitaline, etc. The company operates 7 state-of-the-art production plants in Greece and abroad, 4 milk collection stations, a strong nationwide sales and distribution network and employs a total workforce of 1,400. The aim of the company for the last 60 years is to satisfy on a daily basis the dietary needs of Greek consumers offering innovative products of top quality and high nutritional value.